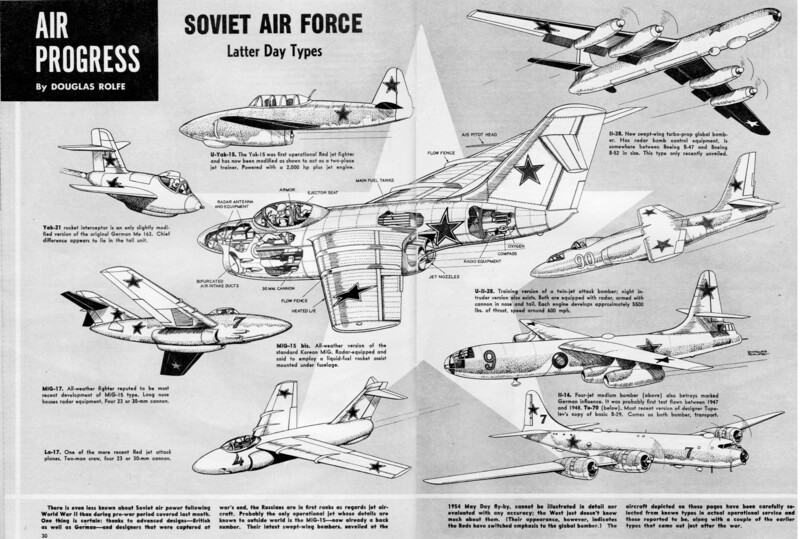 The March 1955 edition of Air Trails magazine, a mere decade past the end of World War II, did a short feature on 9 of the Union of Soviet Socialist Republic (USSR) Air Force's Air Force's most important airplanes. Description and role for each model is brief. Line drawings are provided. You might want to add a little color with a graphics editor and print out the image to use as a poster. U-Yak-15. The Yak-15 was first operational Red jet fighter and has now been modified as shown to act as a two-place jet trainer. Powered with a 2,000 hp plus jet engine. Yak-21 rocket interceptor is an only slightly modified version of the original German Me 163. Chief difference appears to lie in the tail unit. MIG-15 bis. All-weather version of the standard Korean MiG. Radar-equipped and said to employ a liquid-fuel rocket assist mounted under fuselage. MIG-17. All-weather fighter reputed to be most recent development of MiG-15 type. Long nose houses radar equipment. Four 23 or 30-mm cannon. La-17. One of the more recent Red jet attack planes. Two-man crew, four 23 or 30-mm cannon. 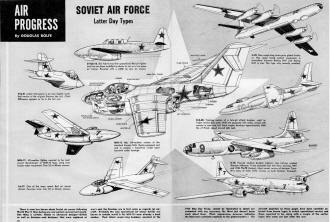 There is even less known about Soviet air power following World War II than during pre-war period covered last month. One thing is certain: thanks to advanced designs - British as well as German - and designers that were captured at war's end, the Russians are in first ranks as regards jet aircraft. Probably the only operational jet whose details are known to outside world Is the MIG-15 - now already a back number. Their latest swept-wing bombers, unveiled at the 1954 May Day fly-by, cannot be illustrated in detail nor evaluated with any accuracy; the West lust doesn't know much about them. (Their appearance, however, indicates the Reds have switched emphasis to the global bomber.) The aircraft depicted on these pages have been carefully selected from known types in actual operational service and those reported to be, along with a couple of the earlier types that came out just after the war. Il-38. New swept-wing turbo-prop global bomber. Has radar bomb control equipment, is somewhere between Boeing B-47 and Boeing B-52 in size. This type only recently unveiled. U-Il-28. Training version of a twin-jet attack bomber: night intruder version also exists. Both are equipped with radar, armed with cannon in nose and tail. Each engine develops approximately 5500 lbs. of thrust, speed around 600 mph. Il-16. Four-jet medium bomber (above) also betrays marked German influence. 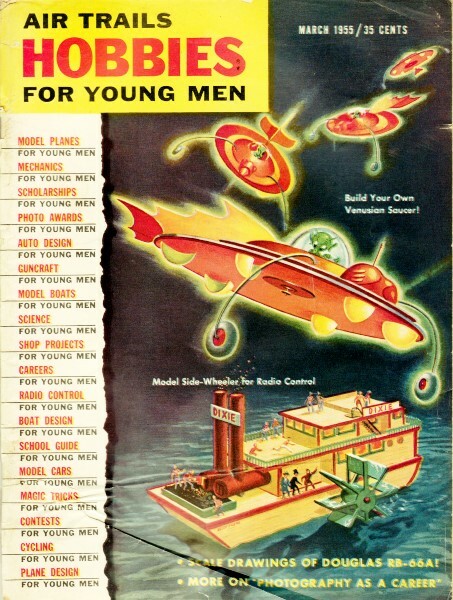 It was probably first test flown between 1947 and 1948. Tu-70 (below). Most recent version of designer Tupolev's copy of basic B-29. Comes as both bomber, transport.